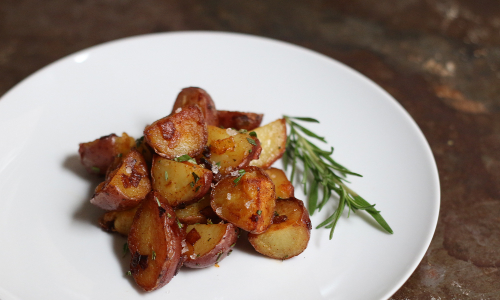 Who doesn't like roasted potatoes? 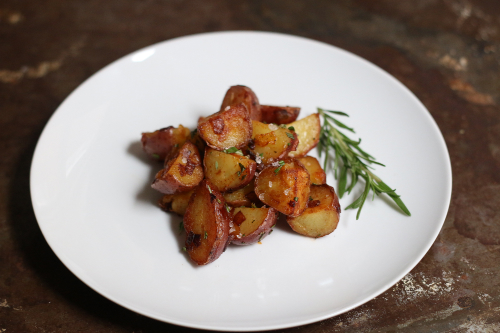 That crispy warm outside crunch revealing a soft creamy potato —toss on a few fresh herbs from the garden and sprinkle with coarse sea salt, you almost have a meal in itself. 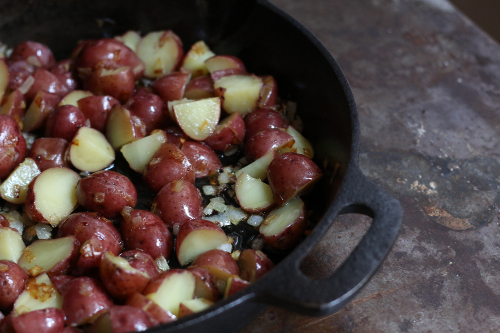 There is one little addition I make just as the potatoes are starting to crisp up that adds flavor and color before hitting the plate. 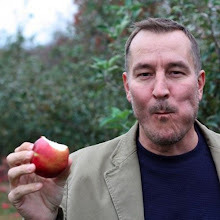 It's my secret ingredient and in the details below. Start by adding potatoes to cold water, bringing to a slight simmer over medium high heat, about 8-10 minutes once at a simmer and until fork tender. Once potatoes are done simply drain into a colander. Heat 1/4 cup of the olive oil over medium heat in cast iron pan (preferably). 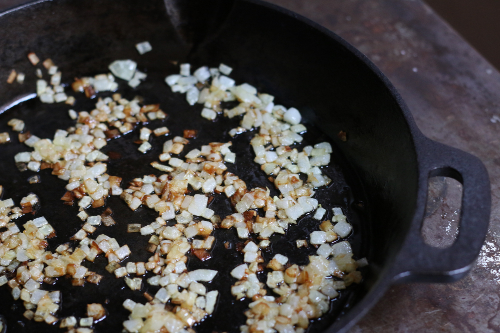 Add the diced onions and heat until just turning brown, stirring frequently as not to burn. While the onion is cooking, slice potatoes in half (some of the larger ones in quarters) and add to the now browned onions. Add the remaining 2 tablespoons of olive oil and cook the potatoes over medium, stirring frequently to prevent them from sticking. Cook potatoes for about 15 minutes and as soon as they start to crisp sprinkle with 2 teaspoons of sweet paprika for a perfect color and spice — it's my proven method! Remove from the heat, toss with fresh herbs and sprinkle with sea salt. 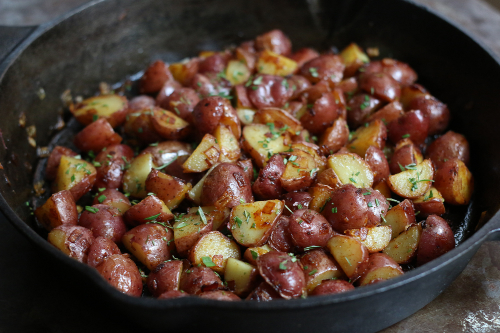 Potatoes can be served family style straight from the pan or arranged on individual plates and garnished with whichever herb you chose for the dish. 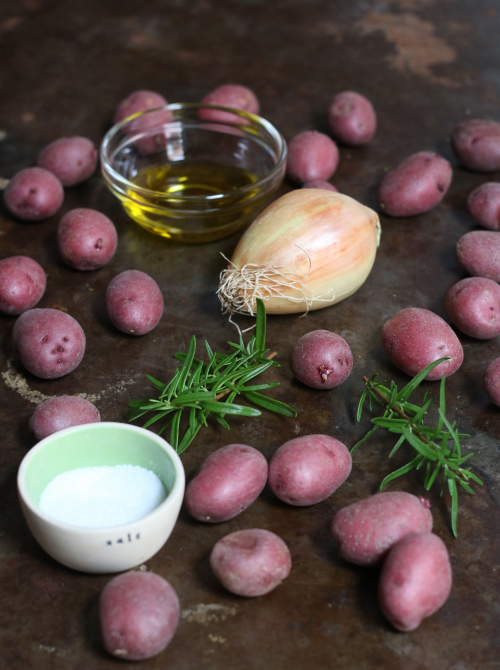 If you have potatoes leftover, save them as I'll be highlighting later in the week a quick and easy breakfast hash that you can enjoy the next morning! I'm so glad you posted this because I love roasted potatoes, but my husband doesn't seem to believe me that they need to be boiled first! Tara, you just cannot get that soft creamy center if you fry the potatoes raw. Thanks for the compliment!